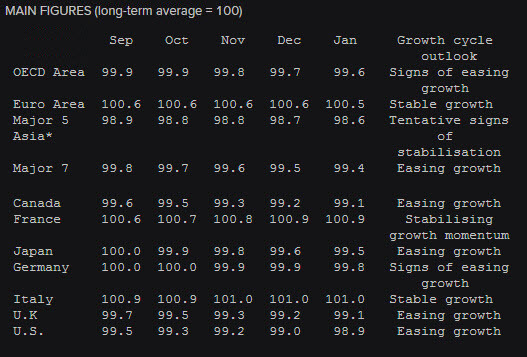 January monthly composite leading indicators flag "signs of easing growth" in the 34 advanced economies which are members. The outlook points to easing growth in the United Kingdom, the United States, Canada and Japan. Similar signs are also emerging in Germany. Stable growth momentum is anticipated in Italy and in the Euro area as a whole. In France, and India, CLIs point to stabilising growth momentum. The outlook for China remains unchanged from last month's assessment, pointing to tentative signs of stabilisation, while in Russia and Brazil the CLIs point to a loss in growth momentum.